After reading this post you all may think that this guy is inspired by anything he see in movies. Last time he wrote for New York. And now for 3 idiots. But tell me friends what do I do? This is my way to express my feeling to world yaar. Its like any process I watch movie, think about movie, then think about write to blog. But I cant help it? 3 Idiots is a film that makes you to think? You can say Sagar writes only after thinking. 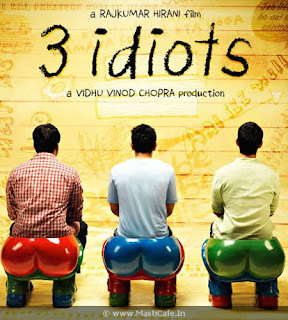 About 3 Idiots, its surely an eye opener to all of us. For parents, students, teachers. Actually as an enigineering student I relate to film, as those 3 Idiots belongs to engineering students. Apart from this I may say that my height perfectly matches with Rancho's (Amir Khan) height. But yes this is the way I think about education. Here with this post I am confessing that I dont want to do engineering(I think mathematics insects find good seeds from engineering). You clear maths you clears engineering. Its a joke! Think about it friends. This is my opinion(as this is my blog). I was really desperate to see this movie, since I come to know that Amir khan, Sharman joshi, Madhavan & Rajkumar hirani come together for Chetan Bhagat's written story. It was magical concept & proved. As a film project it may lacks on some points. But for all my student brothers this was life dose. We students really sucked by the way our education system is designed. I hope 3 idiots film can change this system from root. Because we need such Balaatkar(Chamatkar) in education system. I know it needs some courage for education authorities. Decisions will be very hard to take. I have one solution for this. Just keep hands on heart n say Aal is Well!! All will be definitely Well. January 27, 2010 at 2:00 AM delete This comment has been removed by a blog administrator.